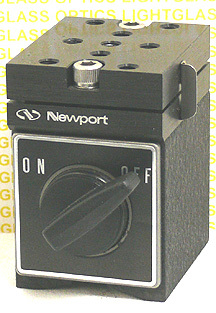 The Newport 110 Kinematic Magnetic Base has a holding force of 90lbs when the magnet is ON. The top of this Magnetic base has aligning hardware which allows you to remove and replace the top and have everything re-align up perfectly. Extra tops are also available from Newport, so you can even have multiple replaceable setups. For heavy or cantilevered loads, the top can be clamped down with 2 1/4-20 screws.